Imagine the socio-political-economic texture of Scotland as an enormous loch. Writer, songwriter, and actor Gary Robertson has placed stepping stones on its sometimes placid, often roiling surface for his audience to skip across in his latest production. The play, raucous and gentle, threatening and comfortable, has the feel of an adult pantomime. Although Robertson touches only lightly on the challenges Scotland faces, The Middle o’ Nowhere is a play well worth seeing. 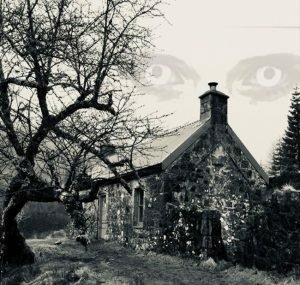 Taking place in a bothy that was the site of atrocities during the Jacobite rebellion, this is a Scots version of a drawing room comedy, with the emphasis on craic and drink. Seven hill walkers from different walks of life assemble by chance and …. To tell more would spoil the plot. The opening scene, played out on the apron before a fallen curtain, begins with jokes and good-natured ribbing between four hill-walkers, Wully, Andy, Sandy, and Shona. The banter draws us into pleasant intimacy with these long-time friends. For all that, however, their first appearance is eerie and a bit disturbing. In the gloaming, their headlamps cast light down their faces, making them look like modern-day plague doctors: white faces and elongated beak-like noses. The uncanniness of the sight foreshadows unnerving events to come. When the curtain rises, we see a traditional set placed in and around a bothy, where all the guests will later gather. The apparition of the Grey Lady also puts in appearances, unseen, of course, by all the guests. Robertson has placed his stepping stones well, as the play is a peppered with laughs and historical raconteuring. There is a small nod to national and world-wide events with mentions of May and Trump, but Roberston focuses on Scottish concerns. Here, the play dips into more serious themes of class inequalities, but rising tempers never turn into a brawl. Good humour and jokes always return to the fore. Stories are told and songs are sung, the audience readily joining in the singing of “Wild Mountain Thyme.” We share the camaraderie of hill-walkers and adventurers. As a storytelling device, putting seven people in a bothy, some of whom are strangers, is a well-used ploy. Whether in a “No Exit” situation or something less fraught as in this play, there are always revelations and insights into characters. As a plot device to heighten the sense of tension, such as in Agatha Christie’s Death on the Orient Express and Then There Were None, or Saki’s The Unrest Cure, it also works well. All through the acts, a beautifully orchestrated tension mounts through sound and set design. The set is well furnished and lit with some good special effects. The sound is brilliant. While everyone played their parts flawlessly, Shona’s (Elidh Robertson) and Andy’s (Kevy Parr) monologues are amongst the most memorable. In the penultimate scene, played out before the curtain, the four friends meet up in a Dundee pub. Without their hillwalking gear, they look old fashioned and colours are muted, almost as if they are their own ghosts, their real life being out on the hills. Touches like these lend depth to the play. You’re not going to get wet in the concerns of the world this week at the Dundee Rep. What you will find is that The Middle O’ Nowhere provides an evening of nostalgia, song, and humour and leaves you with that gratifying frisson — even when crossing over the stones on the loch, no monsters wrapped tentacles around your ankles and pulled you in.